Knuckles in Sonic 2 prototype 0524 for the Sega Mega Drive was released by drx during the February 23rd, 2008 proto release. This prototype differs from the other Knuckles in Sonic 2 prototypes in that it is already locked-on to Sonic & Knuckles, while the other protos are just the S2K chip. Level Select is enabled and no cheat is necessary. Pressing + on the title screen will show it. Debug mode is enabled by holding and selecting a level. The "Knuckles the Echidna IN..." banner of the title screen does not appear, although the title descends from the center to make room for it. Sonic is listed in the act complete message, even though the character is Knuckles. Knuckles acts erratically in the demos. Sonic 2 cheat codes are still implemented and can be accessed through the Sound Test and playing certain music tracks in a row. All the rings are lost after entering a special stage. In the final version they remain after exiting the special stage. When Knuckles reverts from his Super form, he uses Sonic's palette. Due to the change in how his Super form is activated, there is no Super bug after the endpost. In Casino Night Zone Act 1 the game crashes every time the first flipper is used to go to the top left of the map where the hidden rings/ bumpers etc are. It only seems to freeze after the farthest-right bumper from the top is hit. If holding all the time while rising, Knuckles will fly over that bumper and it won't freeze. It also freezes when getting near it while walking on the right (use Debug Mode to place monitors to walk on). It freezes when Knuckles walks right under it when coming from the left. Flying over it as stated before works. 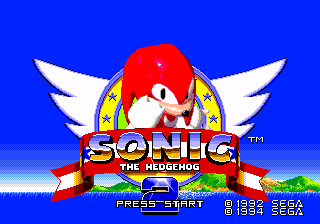 When the title screen appears after exiting the Special Stage using + , the top portion of the logo, including Knuckles, will not bounce down to the bottom of the screen like the rest of the logo. This page was last edited on 27 September 2018, at 08:24.